These studies take you on a journey of discovery as the disciples learn who Jesus really is. Jesus has always been endlessly fascinating to people, yet few know accurately the eye-witness record of Jesus found in the gospels. 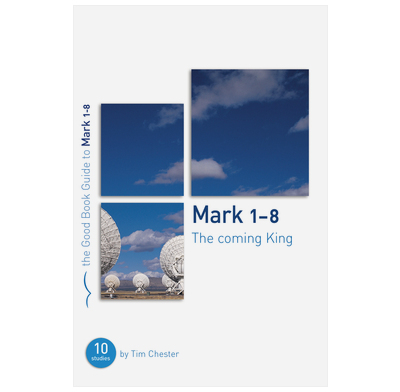 These ten Bible-studies in Mark’s gospel provide a great opportunity to find out the truth about Jesus, taking you on a journey of discovery through the first eight chapters, as the disciples learn who Jesus really is. Find out for yourself just how much Mark has packed into his brief account of Jesus! You’ll learn, beyond doubt, that Jesus is King, but also find answers to many questions: Why does this promised king come in such a secret way? Why is He powerful, yet opposed? Why does He stop people talking about Him? Why do some recognize Him, but not others? Most of all however, with two very practical sections for personal application in every session, this course aims to help each of us live with Jesus as our king. 5.5" x 8.3" x 0.2"
The Good Book Guides have been developed to ensure that each session not only seeks to uncover the meaning of the passage and see how it fits into the big picture of the Bible, but also leads people to apply what they have learned to their lives. Flexible and practical, the Good Book Guides are ideal for small groups, or individual study. After studies elsewhere in the scriptures it has been good to return to the life of Jesus. So far we have only looked at the first three studies, but it has been helpful to have them based on a particular aspect of Jesus' life, and some of the questions have led to some quite lively discussions. Because of the amount of material we normally split the studies into two parts so it is helpful to have application questions in the middle as well as at the end of the studies. I bought this book as leader of a local church Bible study group. Its structure and layout is greatly appreciated by all those using it. It has proved extremely popular. We have been using this in our Bible study group. I have to say the getting in to the text is really good, it helps get the discussion started. But sadly I feel the application is no the best, I feel it misses the main application of most of the passages. Have been challenged by John Stott 's statement that the sharper our vision of Christ the sharper our vision for discipleship. Therefore thought it would be good for our small group to take a closer look at Jesus.We are a fairly mature group in age and although pretty familiar with Mark,s gospel we have only had two sessions in this study guide but finding the content to be good and invoking discussion within the members. We use this study in our home with younger adults and have found it to continually call us back to the truths of God's word. It is relevant, giving us a platform to discuss how the Christian is to work-out the gospel in the surrounding culture surrounding. This is a helpful resource whether you're delving into the gospel of Mark for the first or know it well. Whether for personal study or small groups, the questions provide a useful framework which can be built upon. The leaders notes are good and provide further study suggestions. A good study guide to Mark's gospel that encourages the group to look into the Old Testament. Some of the questions, though, need rephrasing as they can really only be answered using the additional questions in the "leader's study guide" at the back. As there is so much input from the OT, lots of flicking back and forth is needed during the discussion which is difficult for people who are not used to finding their way around the Bible. This study helps you to go deeper into the book of Mark and asks thoughtful questions. Four of us have been looking at this study book together and have found it very helpful. The study content is good, no doubt. The main problem is that the length of the passages is pretty big to cover in a small group session. One one or two sessions the title of the study felt a little bit 'enforced' on the text - but I probably do that in a lot of sermons too. The leaders notes are brilliant as ususal. Working through this at present with many compliments from the small group members. Some groups are finding that they are unable to cover all the questions in an hour. Gladly recommend the material to all.